In the wake of the terrible violence unfolding in Israel-Palestine, we, citizens from around the world, are deeply concerned about your companies’ continued investment in companies and projects that finance illegal settlements and the oppressive occupation of the Palestinian people. 17 EU countries recently issued warnings to their citizens against doing business or investing in illegal Israeli settlements. Given those legal considerations, you now have the opportunity to withdraw investments and respect international law. This is a chance to be on the right side of history. We'll keep pushing until all companies financing the occupation of Palestine withdraw their investments and respect international law. As a new round of violence kicks off in Israel-Palestine and more children are killed, it's not enough just to call for another ceasefire. It’s time to take definitive non-violent action to end this decades long nightmare. Our governments have failed -- while they have talked peace and passed UN resolutions, they and our companies have continued to aid, trade and invest in the violence. The only way to stop this hellish cycle of Israel confiscating Palestinian lands, daily collective punishment of innocent Palestinian families, Hamas firing rockets, and Israel bombing Gaza is to make the economic cost of this conflict too high to bear. We know it works -- when EU countries issued guidelines not to fund the illegal Israeli settlements it caused an earthquake in the cabinet, and when citizens successfully persuaded a Dutch pension fund, PGGM, to withdraw, it created a political storm. This may not feel like a direct way to stop the current killing, but history tells us that raising the financial cost of oppression can pave a path to peace. Sign the petition on the right and call on 6 key banks, pension funds and businesses to pull out -- If we all take smart action now and turn up the heat, they could withdraw, the Israeli economy will take a hit, and we can turn the calculation of the extremists politically profiting from this hell upside down. In the last six weeks three Israeli teenagers were murdered in the West Bank, a Palestinian boy was burnt alive, an American kid was brutally beaten up by Israeli police, and now almost 100 Gazan kids have died in Israeli air strikes. 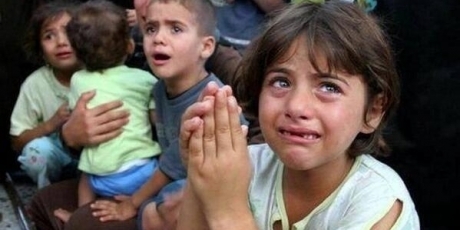 This is not the "Middle East conflict", it's becoming a war on children. And we are becoming numb to this global shame. The media makes out like this is an intractable conflict between two equal warring parties, but it is not. Palestinian extremists' attacks on innocent civilians are never justified and Hamas’ anti-semitism is disgusting. But these extremists claim legitimacy by fighting the grotesque, decades-long oppression by the Israeli state. Israel currently occupies, colonises, bombs, raids, and controls the water, trade and the borders of a legally free nation that has been recognised by the United Nations. In Gaza, Israel has created the largest open-air prison in the world, and then blockaded it. Now as bombs fall, the families literally have no way to get out. These are war crimes and we wouldn't accept that anywhere else: why accept it in Palestine? Half a century ago Israel and its Arab neighbours went to war and Israel occupied the West Bank and Gaza. Occupying territory after war happens all the time. But no military occupation should turn into a decades-long tyranny which only fuels and benefits extremists who use terror to target the innocent. And who suffers? The majority of loving families on both sides that just want freedom and peace. To many, particularly in Europe and North America, calling for companies to withdraw investments from financing or taking part in Israel's occupation of Palestine sounds completely biased. But this campaign is not anti-Israel -- this is the most potent non-violent strategy to end the ritual violence, ensure Israelis' security and achieve Palestinian freedom. Although Hamas deserves much pressure too, it is already under crippling sanctions and facing every kind of pressure. Israel's power and wealth dwarfs Palestine, and if it refuses to end its illegal occupation, the world must act to make the cost unbearable. Dutch pension fund ABP invests in Israeli banks that help fund the colonisation of Palestine. Massive banks like Barclays invest in suppliers of Israeli arms and other occupation businesses. British G4S provides extensive security equipment used by the Israeli Defence Force in the occupation. France's Veolia operates transport for Israeli settlers illegally living on Palestinian lands. Computer giant Hewlett-Packard supplies sophisticated surveillance to control the movement of Palestinians. And Caterpillar provides bulldozers that are used to demolish Palestinian homes and farms. If we can create the biggest global call ever to get these companies to pull out, we will show clearly that the world will no longer be complicit in this bloodshed. The Palestinian people are calling on the world to support this path and progressive Israelis support it too. Let’s join them. For further questions check out the Q&A page, and some sources here.